This is a collection of photos from the photo albums stored at the Wilson's Crabin' Cabin in Newport, Oregon. The photos are irreplaceable, so I decided to scan them in as a backup. 1) For Favorites and Selections, click here. 2) For a Hard Back photo album from the Cabin, click here. 3) For the First Rollodeck from the Cabin, click one of these: Roller1A, Roller1B, Roller1C. 4) For the Second Rollodeck from the Cabin, click one of these: Roller2A, Roller2B. 6) Click Crabbin_Cabin_Salvage_Day to see pictures from 9/30/2006 a few days before we bulldozed the original cabin down to replace it. My grandfather, Ralph A. Wilson, retired around 1971 from farming his 100 acre farm in Salem, Oregon. In the 3 or 4 years leading up to his retirement he first fished on charters, then bought a boat in 1970. He named the boat the "Lynne Dee Lou", which is derived from the names of his 3 grand-daughters: my sister Cheryl Lynne Wilson, and my cousins Dee Ann Wilson and Karen Louise Wilson. The original Lynne Dee Lou was a used aluminum 21 foot "Starcraft" with an inboard engine (small block chevy) and a boat trailer you could haul behind a pickup truck. For the first two years Grandpa would drive the boat to Newport Oregon from Salem and stay in hotels, dragging my grandmother Erma with him. After two years, Grandma suggested they buy a small cabin (Grandpa would tell the story saying he almost fell out of the pickup in shock when she suggested it). After hunting around for a little while, they found the tiny house pictured above. They purchased it on July 21st, 1970 for $5,000 from the Newport Hospital who had taken it in payment for a debt. 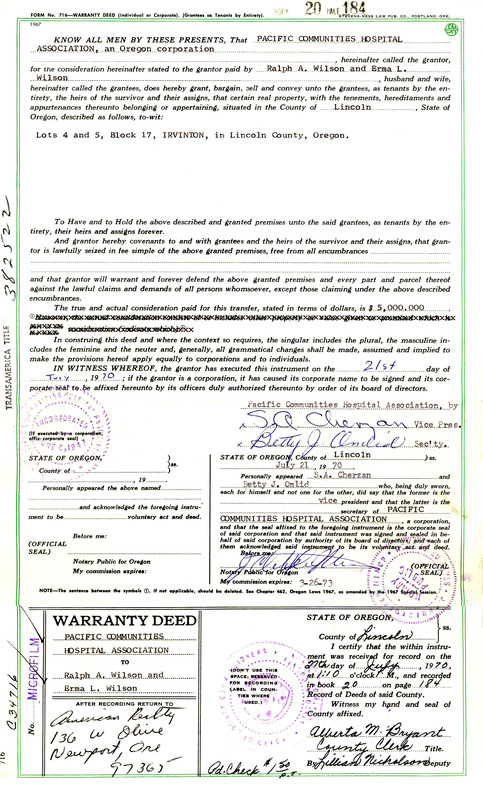 The deed can be seen here: 1970_Newport_Oregon_Deed. It was built sometime in the 1800s, and it was in shambles. Over the years our family cleaned and fixed it up, built on additions, replaced the foundation, roof, etc. All the work done by hand, the nails hammered by our family. Eventually we all named it the "Crabbin' Cabin", because of the favorite activity of catching crab out of Newport bay (Yaquina Bay). Over the next 30 years, an absolutely ridiculous number of guests visited and stayed in the "Crabbin' Cabin". Visitors stay for free, whether or not any of our family is staying there with them. When Grandpa was there, he would take guests out fishing and crabbing, and a truly enormous amount of crab, salmon, and flounder were caught by the crews of the Lynne Dee Lou. The 653 pictures found in the links above come from several photo albums normally stored at the "Crabbin' Cabin". The vast majority of the photos are taken in the same spot, the back porch of the cabin, showing that day's catch of fish and crab. Each individual photo is pointless, but the total collection is a stunning testimony to the number of people who fished with Grandpa. And for every photo shown here, there were a hundred other fishing trips and visits to the Cabin that aren't shown. The last time I went salmon fishing with Grandpa was in 1994, a year before he died. Salmon fishing is done out in the open ocean where you "troll" by driving very slowly in the boat while dragging one fishing line behind the boat for each fisherman. After an hour of trolling, we hooked a fish on Grandpa's light "sport pole", which means he reels in the salmon, the rest of us get our lines out of the water so they don't get tangled or in his way. After I got my line put away, I looked over and there was Grandpa, 87 years old, with a huge smile on his face as he worked the reel bringing the salmon towards the boat. After all the thousands of salmon he had reeled in over his life, he still loved every catch. In many of the pictures you can see enormous catches of flounder (whitefish) and also big loads of Dungeness crab caught in one afternoon of fishing. I remember in the late 1970s being frustrated if my hook was in the water for more than 5 minutes without landing a fish. Today (2003) all the flounder are gone from Newport bay (Yaquina Bay), and you're lucky if you catch three or four crab in an afternoon. Nobody really knows what happened for sure. The fishermen blame the sea lions and seals which have moved into the bay and are protected. The environmentalists blame over-fishing. It might be natural fluctuations of marine populations. Whatever the reason, it's sad you can't fish and crab like that anymore out of the bay. We salvaged the contents of the cabin, then tore it down - STORY UNDERWAY!!) Click Crabbin_Cabin_Salvage_Day to see pictures from that day. Click here to return to Random Links.